Surreal Tufa towers that resemble moon rock rise out of the water, giving evidence of a much higher lake level. 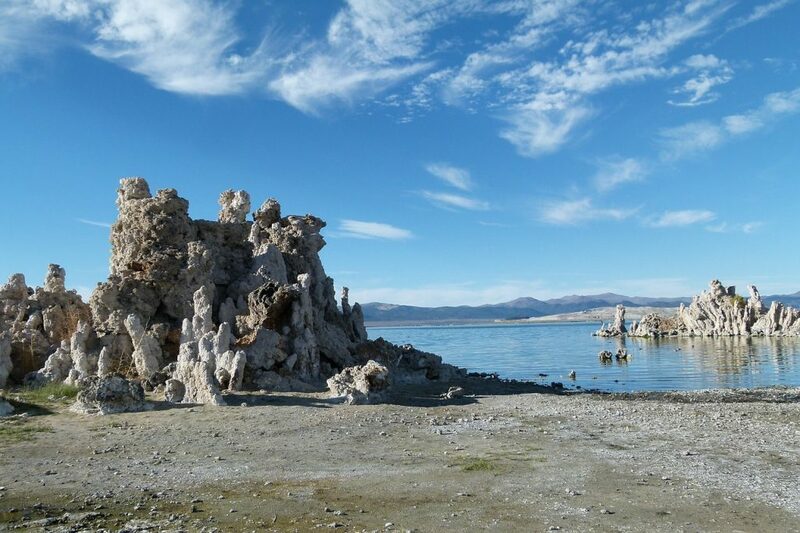 The Tufa towers are formed under water by a reaction of calcium in fresh water springs rising from the lake’s bottom reacting with the carbonate in the lake water to form a solid precipitate called Tufa. Believe it or not, Tufas used to lie below the lake. The lake level has been lowered due to diversions of freshwater creeks that feed the lake. Mono Lake receded 45 vertical feet, exposing these unique rock formations. A decision by the California State Water Resources Board on September 28, 1994 has reversed the policy of excessive water diversions and the lake water level is now on the rise . Now you can see Tufas jutting up to 15 feet out of the water’s surface, forming an uncommon watery forest of porous rock, perfect for nature-lovers and families to explore. There are few things more magical than paddling through this fantastic waterway, spotting migratory birds, otherworldly aquatic life and feeling the extraordinary buoyancy of your boat in water that’s three times saltier as the ocean. Mono Lake’s natural and geologic history attract naturalists and scientists the world over, including ornithologists, geologists, volcanologists, and everyday nature lovers. 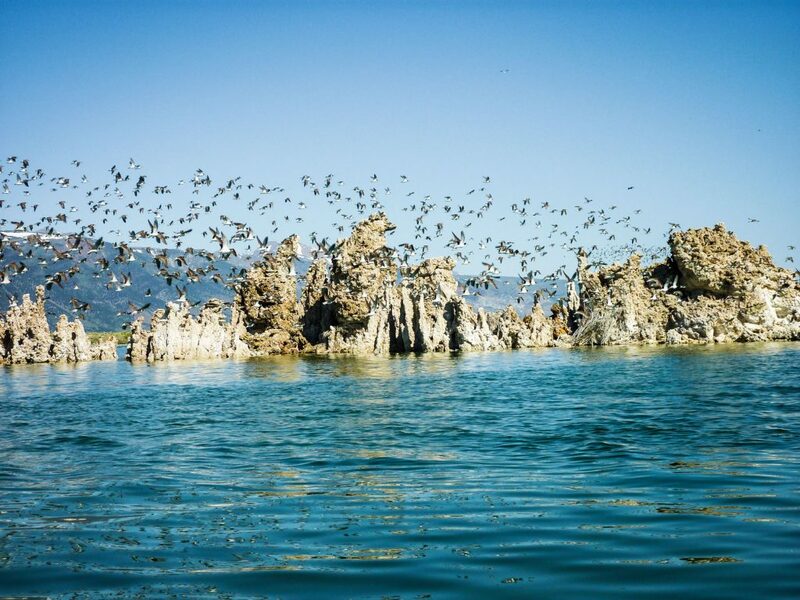 Mono Lake is one of the biggest stops on the Pacific Flyway. Migratory birds use Mono Lake as a stopover as they fly from their nesting grounds in Alaska and the Arctic regions to their winter homes in Bolivia and Argentina in South America (and back!). Mono Lake offers these exotic birds plenty of food and a much-needed stopover on their long-haul migratory flights. In fact, they can cover up to 3,000 miles (4,800 km) in only three days! 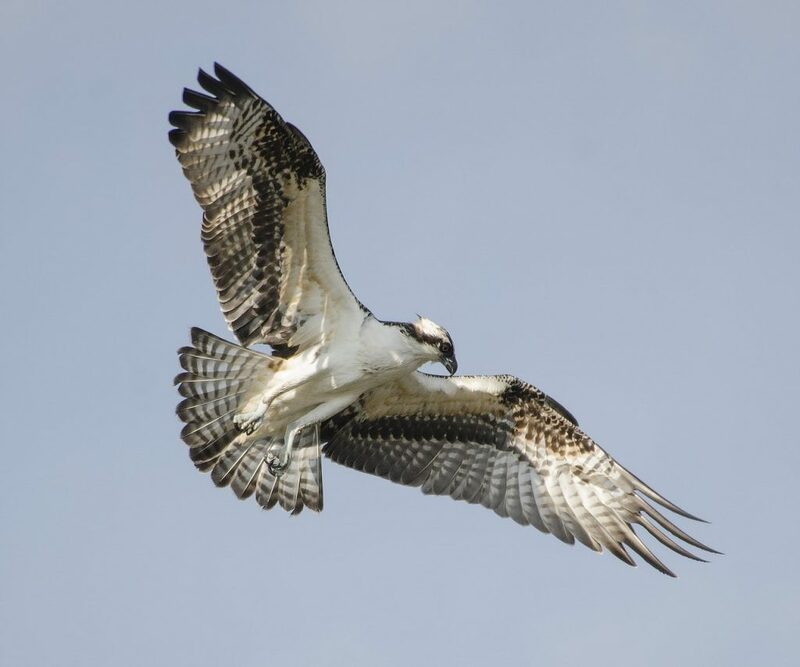 A few favorite winged beauties you’re sure to spot include Violet Green Swallows and Ospreys. Mono Lake is an ancient inland sea whose age can be dated back to the eruption of the Long Valley Caldera 767,000 years ago. In 1908 an exploratory well was drilled on Paoha Island in search of oil. No oil was discovered but rocks from the Bishop Tuff Formation from the caldera-forming eruption in Long Valley were found in the lake bottom sediments, indication that the lake existed when the eruption occurred. Above the layer of volcanic rocks no salt was found, showing that the lake has had water since the Long Valley Caldera eruption. Even younger volcanic activity formed the Mono Craters 40,000 years ago to the south of the lake. A small eruption on the northern end of the craters created Panum crater 700 years ago. More recent activity 300 years uplifted the lake bottom sediments to form Paoha Island. At the end of the most recent ice age 13,000 years ago Mono Lake was five times bigger than it is now and actually overflowed to the north. The ice age lake was called Lake Russell after the geologist Israel Russell that mapped the basin in the late 1800’s. Strandlines or beach terraces from the ice age lake can be seen on the mountain ranges to the north of the basin. Your guided kayak tour along Mono Lake’s shoreline lets you experience one of the oldest living lakes from the unique perspective of a touring kayak. 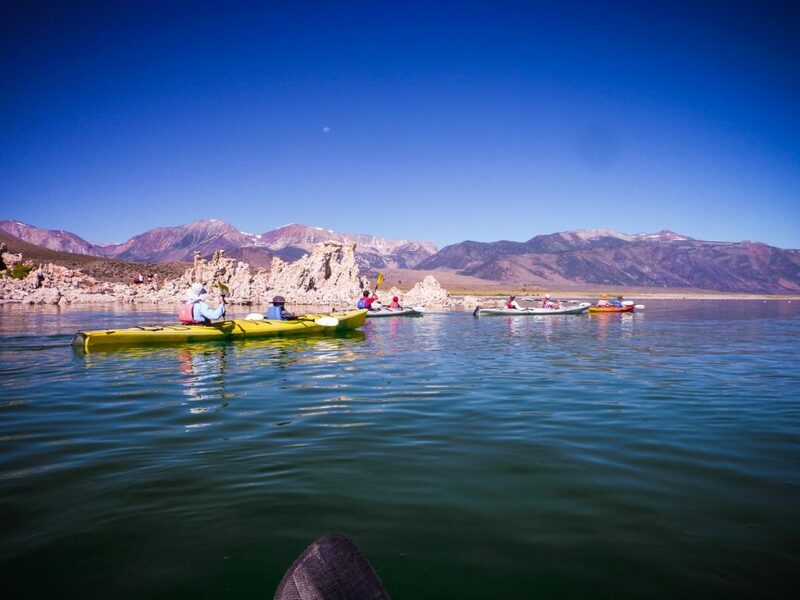 You’ll paddle with your guide through the Tufa towers and along Mono Lake’s intriguing shoreline to the Rush Creek delta. As you glide across the glassy water you’ll have dramatic views of the Sierra Nevada Mountain range to the west and volcanic mountain ranges to the north and south. The lake has been called the “dead sea of California” but it is actually teeming with life. Trillions of brine shrimp and alkali flies provide an unlimited buffet for the California Gull that nest at the lake and several other species of migratory birds that stop at the lake for an essential fuel supply on the trip south for the winter. As we paddle across the water, you’ll experience first-hand the natural history, geology and secrets of Mono Lakes as your guide explains how a unique mix of ecology, geology, natural history and water politics have influenced the water level and changed Mono Lake over the years. You’ll paddle to a unique (and a bit secret) location on the shore that cannot be accessed by vehicles, where you’ll stretch your legs and explore the interesting rocks and bizarre aquatic life there. On the trip back, you’ll be treated to stunning views of the Eastern Sierra, jutting more than 13,000 (3962.4 m) into the sky. Don’t worry if you’ve never kayaked before! Our kayaks are extremely stable and easy to operate sea kayaks. And your guide will provide a thorough orientation and instruction before you launch. * There is also a mandatory $5.00 California State Parks concession fee for a guided tour. We will meet you at 8:30am at Navy Beach on the South shore of Mono Lake with all the kayak equipment you need for your Mono Lake adventure. Expect to see underwater tufa towers, brine shrimp, lake-bottom springs, and a variety of common and uncommon birds. Your guide will plan your route according to the weather conditions, ensuring your safety and enjoyment. Expect to get back to the launch site before the afternoon winds start. Your guide, Stuart Wilkinson, is a longtime Mono Lake paddling guide, veteran kayaker and a professional geologist. He and his wife Sue own and operate Caldera Kayaks, and have been operating on Mono Lake for over 20 years. Shorts or synthetic long pants, zip-offs pants. Quick drying long pants and long sleeve sun/salt shirt. Tours depart from Navy Beach on the south shore of Mono Lake. To reach Navy Beach from Mammoth Lakes go north on highway 395 to about five miles north of the June Lake Junction to route 120 East. To reach Navy Beach from Lee Vining / Tioga Pass Route go south on 395 about five miles to route 120 East. Take route 120 east towards Benton for five miles. Beach. Turn left at “T”. Follow road to parking area. Reservations are required for the tour. Caldera Kayak tours are typically offered mid-May through mid-October. To check for availability and reserve your spot, please fill out the form below and tell us a bit about yourself and when you plan on being in the area. We are currently working on our summer 2019 tours. The schedule is subject to change depending on the weather. Tours are available mid week and over weekends. Let us know about your travel plans and we will try to work with your itinerary.